For as long as cetaceans have been held in captivity, marine parks and aquaria have kept an assortment of species. Today, most showcase the dependable, crowd-drawing staples (such as bottlenose and belugas) or the coveted marine park jewels (orcas, or albino dolphins – of any species). Once in a blue moon, more elusive species have cropped up at marine parks, whether they were the result of strandings or were intentional captures for study. 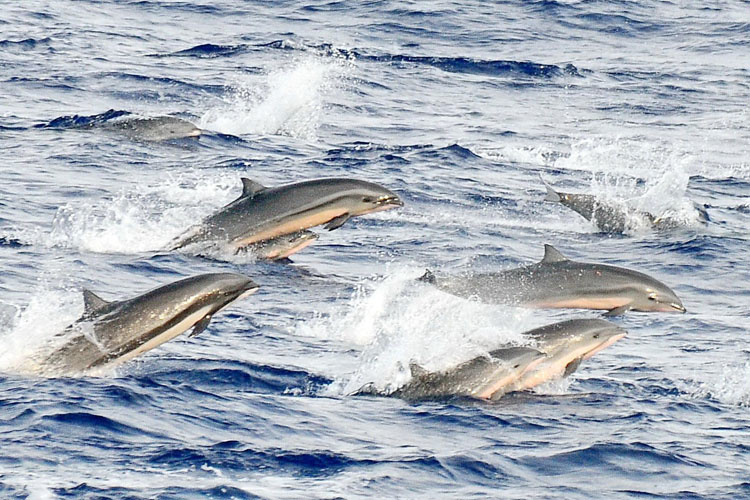 These cryptic dolphins have been kept only a handful of times. Yet their presence have not always been announced to the public. Some have been written only in old scientific reports, conference booklets or academic books. Most are not easily accessible via web. Much like the Dall’s porpoise and Indus River dolphins articles I have written before, I felt these species deserve to have their chapters illuminated. The list of rare and unusual species held captive is surprisingly extensive. A pod of Fraser’s dolphins. Courtesy NOAA Fisheries website. Gregarious, skittish but willing to catch a ride on a ship’s bow wave, Fraser’s are an understudied pelagic species. Gathering in pods of anywhere between 100 to 1000, they have been mainly spotted in the Gulf of Mexico and Indian Ocean. 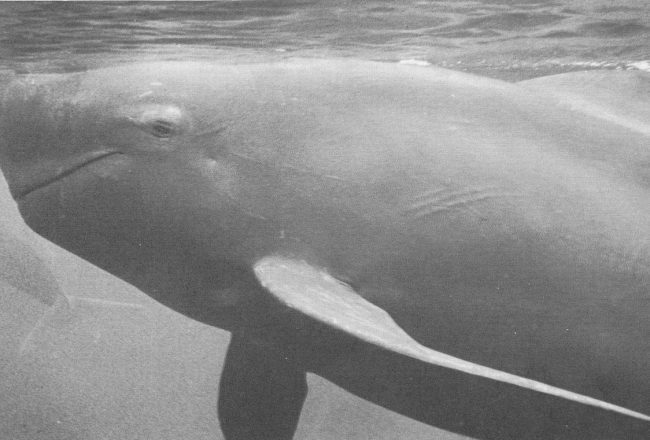 From April 1974 to July 1975, Hong Kong’s Ocean Park went on a scouting and collection mission in the Philippines to stock its developing park with various cetaceans. 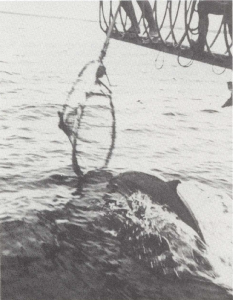 From June 1974 to to July 1975, sixteen Fraser’s dolphins were captured with a hoop-net in the Camotes Sea, east of Cebu City, before being hauled aboard. Some dolphins were kept in a make-shift holding pen right off the Cebu City shore, made with chain-link fence stretching 12 meters and allowing for a water depth of 6 meters. 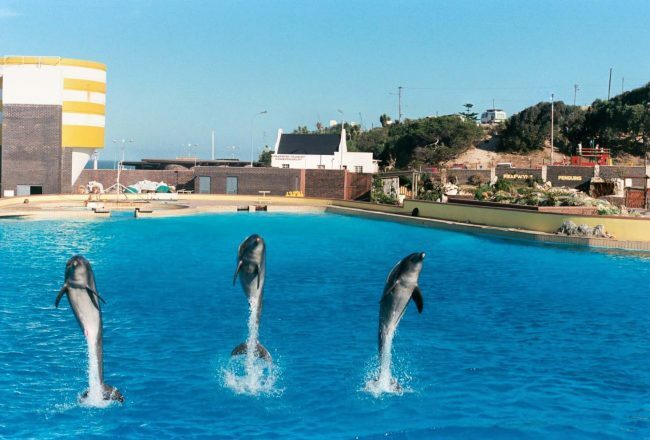 Other remaining dolphins captured in the spring and summer of 1975 were kept in a 2m-deep, 8m-diameter above-ground pool. A Fraser’s unknowingly leaping into a hoop net. Courtesy Ocean Park, from 34th IWC Report (1984). Once placed into the enclosures, all the captive Fraser’s went on a hunger strike; six were released after ten days because “they refused to eat and were considered poor risks.” Another six, despite being force-fed, died within 14-21 days. The remaining four managed to survive for 30-100 days (average 45 days). Another Fraser’s (an adult female) was held at Okinawa Churaumi Aquarium for 20 days after it was rescued from being caught in a gill net on September 1, 1984. Fraser’s introduced into the holding pen (left); another is force-fed (right). Courtesy Ocean Park, from 34th IWC Report (1984). Heralding from New Zealand waters, these endangered cousins of the Commerson’s dolphins had a brief stint in aquaria with poor results. From February 6-12, 1970, Marineland Napier of Hawke Bay embarked on a capture expedition, following the conclusion of their 12-month survey on dolphin population estimates and studying their behavior. Two males and two females were captured via “tail grab” method in Cloudy Bay during the six day trip. They were held in a 5.4m x 1.2m portable pool at a former whaling station in Tory Channel before being trucked and flown to Napier, two at a time, during an hour and a half-long flight on the 13th. While the small pod arrived “in good condition” and “readily ate” after being placed into a hospital pool filled with natural seawater pumped directly from the ocean, the optimism would not last. A female died six weeks after capture from undisclosed reasons. Two and a half months later, more disaster struck. While details aren’t exactly clear, one of the facility’s leopard seals escaped from its enclosure, found its way into the Hector’s tanks and went on a “rampage,” killing the remaining female. While the two males were unscathed, one died two weeks after the attack – once again, his cause of death was not given. This left the remaining dolphin, ‘Narwhale,’ named after the boat that captured him, alone. It is worth mentioning that Hector’s were highly susceptible to staph infections, as well as skin issues – which may had played a role in two of the dolphins’ deaths. In a log published in the pages of Investigations on Cetacea, it was noted on May 24 that when rough seas caused the tanks began to fill with cloudy waters, Narwhale became much more lively, diving in his enclosure more than he had ever before. Napier staff came to the conclusion that certain salinity levels and strong sunlight exacerbated his skin condition. Solar screening was installed over the pools, and tank walls were not cleaned to allow algae to grow, preventing sunlight reflection. His skin would gradually recover. 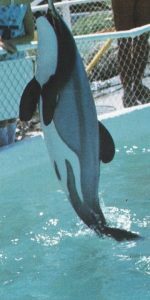 At the beginning of the summer, Narwhale was moved from the hospital pool to the main show tanks (where the common and dusky dolphins were held), and “responded well” to a month of basic training. By the fall of 1970, he could “jump and retrieve a ball on command,” performing alongside his dusky dolphin and common dolphin tank mates. He would live just two and a half years at Napier, perishing sometime in late 1972. 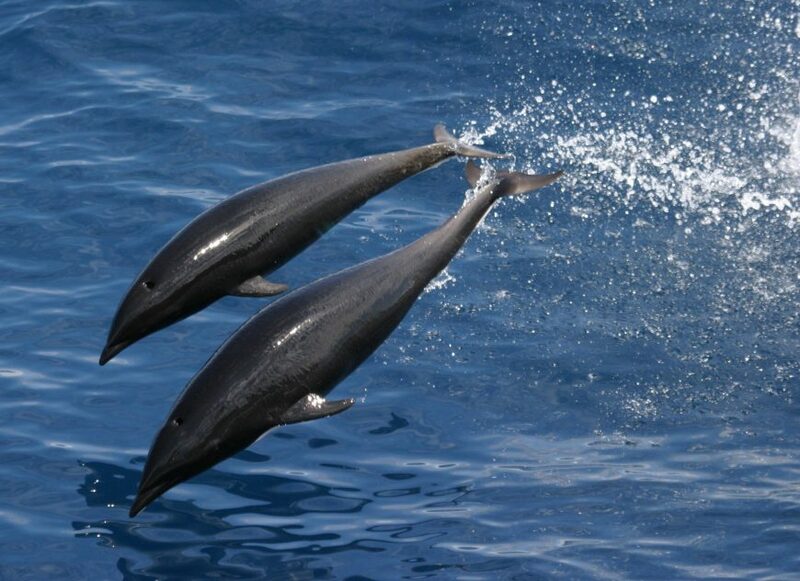 Finless and nomadic, these torpedo-esque dolphins (or Lissodelphis borealis) roam the Pacific Ocean. They have been spotted off the California coast following the shoals of squid in the winter and spring. 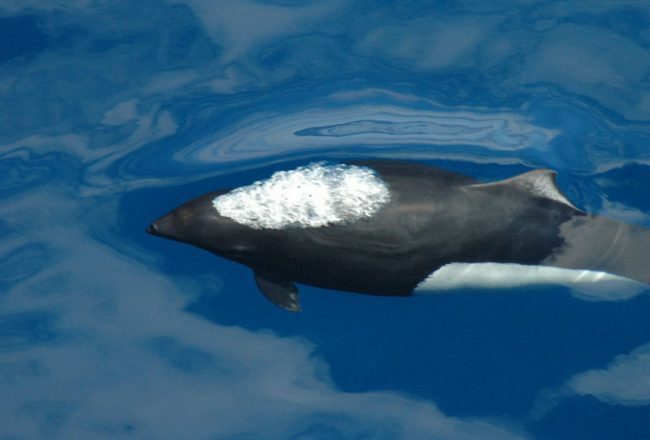 One of the only known photo of the N. Right Whale Dolphin held at Marineland of the Pacific. The Dall’s can be seen in the background. Valley News, November 14, 1972. A better-recorded capture attempt was undertaken by Marineland of the Pacific. On February 27, 1969, Marineland’s capture team trailed a pod near Catalina Island before deploying their modified hoop net. At the moment of capture, the dolphin “became immobile on the surface the instant the net-snare was pursed around the head and flippers.” The immature male was taken back to the park and placed in a tank with four Pacific white-sided dolphins, where upon release, it quickly fell into the pod’s swimming pattern. It died three days later; the necropsy’s findings pointed of signs of stress due to capture and shock of a new environment. Marineland tried their luck again in 1972. On February 25, another young male L. borealis was captured, and kept in an acclimating tank with the Pacific white-sided dolphins. He ate readily the following day and survived beyond the three day mark. Three months later, he was moved into the 540,000 gallon display tank with a Dall’s porpoise. Their public debut was advertised in local newspapers, which highlighted their rarity. The L. borealis lived for a record 15 months at Marineland before dying on May 18, 1973. His cause of death was “undetermined,” yet an extensive infection of sinus flukeworms, ulcerated and abscessed sinuses was found at necropsy, which most likely contributed to his demise. 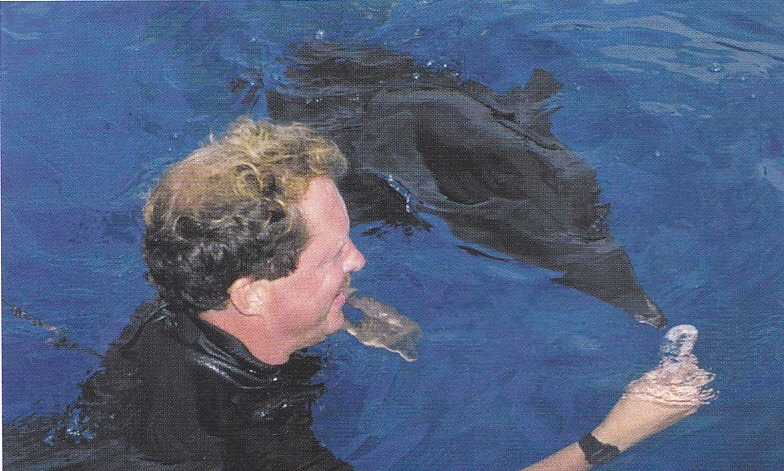 The last intentional live capture of L. borealis was in 1982, undertaken by SeaWorld, San Diego. On February 4th, two males and a female were captured. Within two weeks, the trio had perished. One died of shock, another from pneumonia, and another from cerebral hemorrhage. Almost all L. borealis that have been taken into captivity since have been stranded individuals. A male and a female were found stranded on the Nagai coast, in the Kanagawa prefecture, Japan, on May 24, 1976. The pair were taken to Enoshima Aquarium, where they lasted for two days. The Pacific Marine Mammal Center, a Laguna-based rescue facility specializing in caring for stranded, orphaned or injured pinnipeds, took in a male L. borealis on February 18, 2006 (stranded on San Onofre) and another on the first of October, 2007 (stranded in Marin County). Both died the day of their rescues. As for SeaWorld San Diego, two more individuals were taken in for rehabilitation. An adult female (pictured below), found on a San Luis Obispo beach on September 1995. She lasted for a little over a month in the rehabilitation tanks; she met an untimely death when the facility experienced a brief power failure. When the lights suddenly returned, the female L. borealis became spooked and crashed into the tank walls, dying on the spot from a broken jaw and a concussion. Another – a juvenile male – washed ashore on a Corona del Mar beach on May 21, 2006. Emaciated and sickly, it was initially pushed back into the water by a beachgoer before he restranded. He was rushed to SeaWorld San Diego, where he was tube fed synthetic dolphin milk in a recovery tank. His health never stayed stable; his behavior hinted neurological damage. He died after two weeks of care; it would be later discovered that cause of death stemmed from severe hydrocephalus, and non-suppurative meningoencephalitis caused by a Brucella infection. 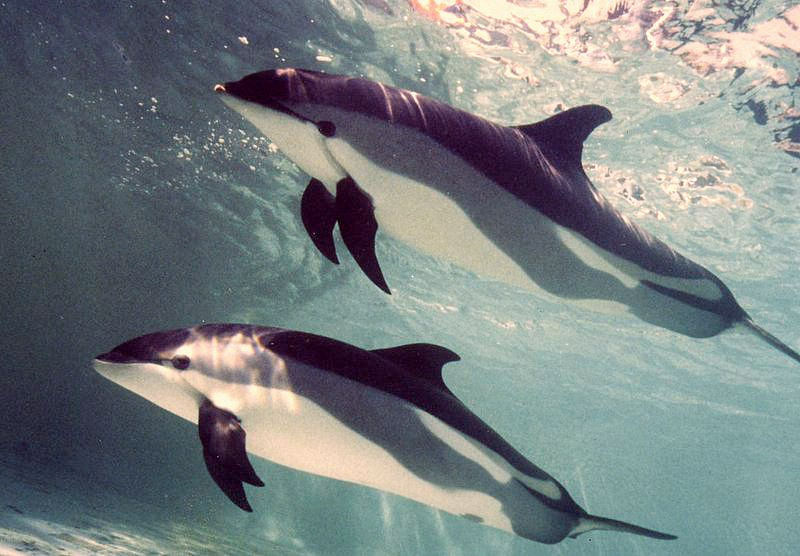 Mostly inhabiting the cold, northern Atlantic ocean, Atlantic white-sided dolphins (or ‘lags,’ short for their scientific name, Lagenorhynchus acutus) have been occasionally kept in a captivity for rehabilitation purposes. The first individual recorded was a young, 1.5m female Atlantic lag, found stranded on the isle of Texel, in northern Holland. Whether she was sent to Sea Mammal Research Company/SEAMARCO or Dolfinarium Harderwijk is not entirely certain; she survived in captivity for six days. 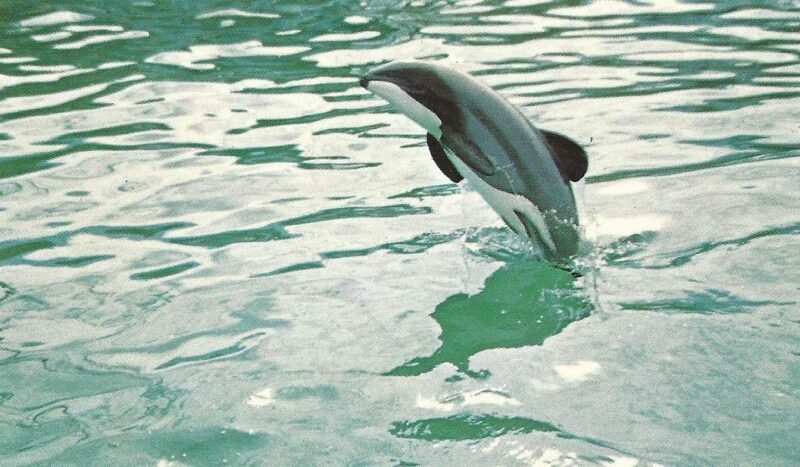 Since 1983, Connecticut’s Mystic Marine Life Aquarium has rehabilitated and released a small number of Atlantic white-sided dolphins. On December 7th and December 17th, 1983, Mystic received three stranded Atlantic Lags – two males and one female – from the Massachusetts coastline. One male died from pneumonia ten days after his rescue, while the other, nicknamed Harvey, rammed into the side of the medical tank on the second day of captivity, breaking his jaw. While he recovered from the incident, his female companion would not join him at his spring release, dying from septicemia and pneumonia. Harvey, on the other hand, was released on April 11th, 1984 amongst a pod of passing-by Atlantic lags. 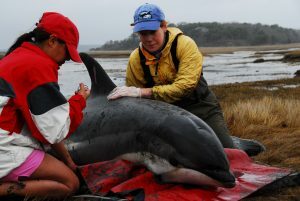 His companions’ deaths, however, were not in vain: researchers took advantage of the situation and took swabs from all three dolphins to study their microbes, cumulating in a 1988 Zoo Biology report. In it, the authors described how all three carried several harmful microbes, including Klebsiella, Candida, Streptoccocus and Staphylococcus bacterium. The unnamed 1985 Atlantic lag, recovering at Mystic Marinelife Aquarium after stranding in a marsh in Long Island. She would only live almost a week after her rescue. Taken from Asbury Park Press, June 6, 1985. 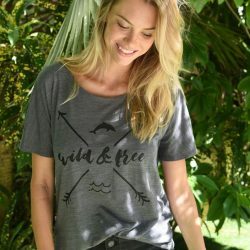 In their conclusion, they recommended new measures to separate newly rescued dolphins from the established captive colonies in any future rescue efforts. Other lags would be rescued in 1985 and 2003, but would succumb from illness. For Mystic, the last successful rehab and release project was in February 1991, when two Atlantic lags stranded in Wellfleet, Massachusetts. Rushed to the aquarium, the male-female pair were kept behind the scenes for the next eight months. Researchers D. Nelson and J. Lien pounced on the opportunity to study their behavior, learning the dolphins were quite sensitive to excessive noise and water temperature changes. On June 9, the female Atlantic lag died without warning, despite repeated routine physical examinations. 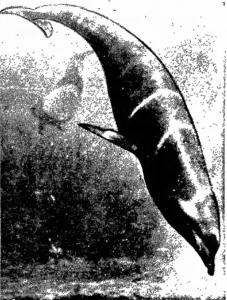 During her necropsy, a deep abscess in her right lung was discovered, which “she had harbored since stranding.” The male would stay at the aquarium until given the all-clear in early October. 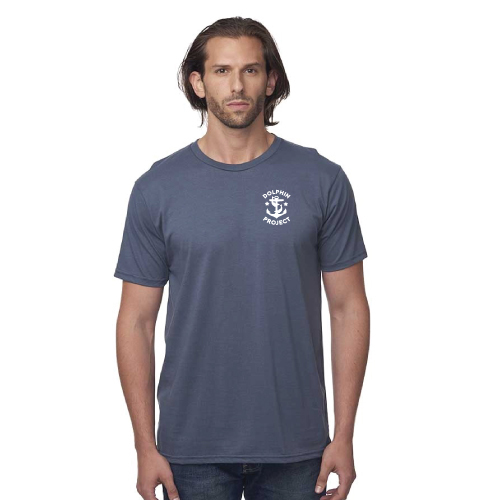 On the 23rd, he was taken to the coast of Cape Ann and returned to the ocean. A yellow satellite tracker was fitted onto his dorsal fin by researchers of Oregon State University’s Marine Science Center prior to his release. For six days, his movements and dive habits were were tracked before the satellite was knocked off during a severe storm. The Atlantic white-sided dolphin pair at Mystic Marinelife Aquarium, 1991. 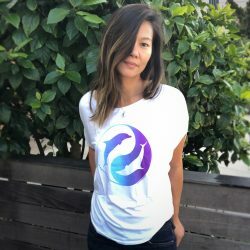 Courtesy Mystic. Cetaceans Live-Captured for Ocean Park, Hong Kong April 1974-February 1983 by D.D. Hammond and Stephen Leatherwood for the International Whaling Commission Report 34 (1984). Small Cetaceans held in Captivity in Australia and New Zealand by M.W. Cawthorn and D.E. Gaskin for the International Whaling Commission Report 34 (1984). WhaleLab Stranding Database, Shiminoseki Marine Science Academy. Last updated 2014. Translated from Japanese via CetaBase. Review of the Live-Capture Fishery for Smaller Cetaceans taken in Southern California Waters for Public Display, 1966-73 by William A. Walker, Journal of Fisheries Research Board of Canada (1975). 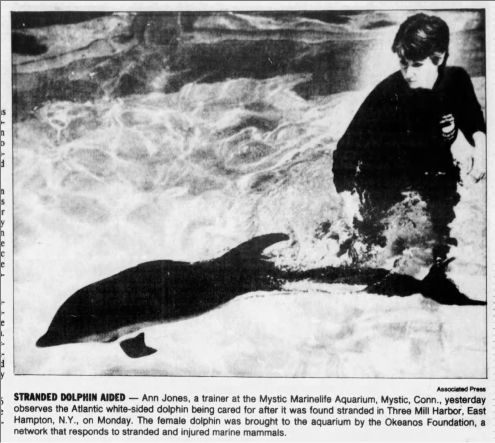 Aquarium returning dolphin to Atlantic Ocean, Associated Press, Lubbock Evening Journal, April 13, 1984. Cephalorhynchus hectori subsp. bicolor sightings, capture, captivity by R.S. Abel, A.G. Dobbins and T. Brown for Investigations on Cetacea, Vol 3. (1971) edited by Giorgio Pilleri. Microbiological characterization of three Atlantic whiteside dolphins (Lagenorhynchus acutus) from stranding through captivity with subsequent rehabilitation and release of one animal by John D. Buck, Patricia Bubucis, and Stephen Spotte for Zoo Biology, Vol. 7, No. 2 (1988).